Do you like to experience a full sized grilling but you just don’t have the room for a traditional big sized gas grill or just no need to cook for large servings? Well worry not, you don’t need a full-sized grill just to enjoy a great cookout. Manufacturers have produced gas grills that only take up a little foot print. Hence, these kind of grills are perfect for you whether you live in an apartment, a condo or just don’t have a big backyard or patio to fit big grills. 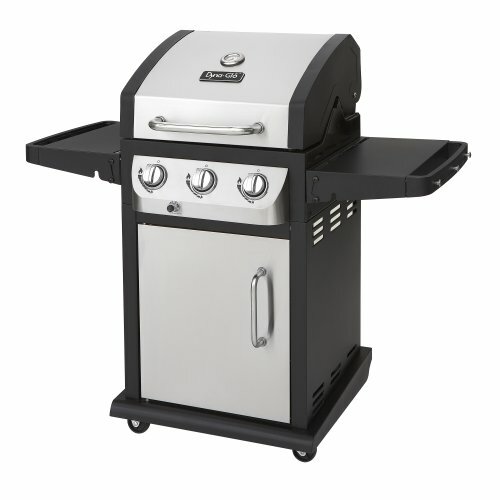 I recommend to have a space saving gas grill that looks and works similar to those of big sized grills for better experience, so we focus more on the best small gas grills that have as little footprint as possible but has the full height of a grill. But tabletop gas grills can also be a good option, especially for apartments that have stricter rules on grills. So for better options, I list here a range of the best small gas grills to choose from. The Spirit E-210 is the smallest and least expensive of all Weber full sized grills. Aside from the small footprint, this also a basic grill where the 2 burners can generate up to 26,500 BTUs of heat for 360 square inches of cooking space. The size is good enough for a small size family since anyone buying this grill won’t really be expecting cooking for large crowds. But it’s actually a little lacking of heat for the size so preheat can actually take a little time longer, although it can still reach a good high amount of heat. Nevertheless, the grates make up for its heat capacity since these grates can hold a lot of heat and have good heat retention to allow heat transfer that makes a good job of grilling steak or burgers. 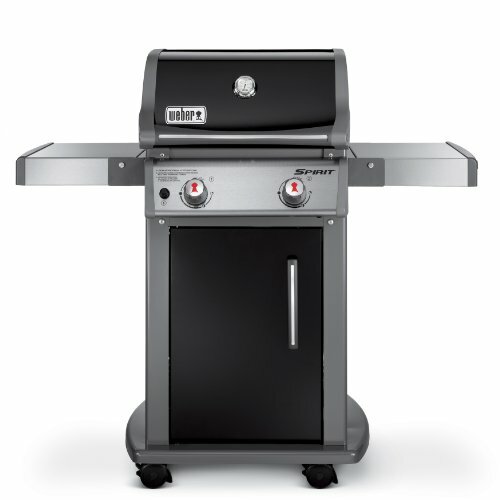 If you are considering a gas grill with side burner but still has little footprint, then just add almost $50 and you can have the Weber Spirit E220, which is the closest counterpart for the Weber E210. Overall, the Weber Spirit E210 received great satisfaction from its user as high as 4.6 out of 5 star rating. While the Weber Spirit E220 also received the same rating. Dyna-Glo produces among the best gas grills that also have a reasonable price, not too expensive nor too cheap that will only last for a few months or a year. So when they produced a smart space saving gas grills, it would be a waste to pass this opportunity up. The Dyna-Glo Smart Space Saving 2 Burner Gas Grill is a good offer. It doesn’t take too much space where its dimension is 23.03L x 45.43 H x 45.83 W inches. It’s a good deal that it received a user rating of 4.6 out of 5 and we even have featured this before. You can read our full review of it for the Best Gas Grills Under 500 Dollars. Product Details:Because of that, we are featuring another great offering from the same manufacturer, the Dyna-Glo. This time, Dyna-Glo offers another similar product called the Smart Space Living, model DGB390SNP-D. This unit has 3 burners, higher heat output and has a dimension close to the other Dyna-Glo two burner gas grill. This is a basic gas grill but still has the fold down side tables which is great. In you’ll need extra space to place your plates on, you can bring the side tables up and just fold them back down again if not in use to maximize the space in your place. Of course with limited space, you can’t expect it to have other use like side burner or rotisserie system. But it is definitely a competent grill that knows what it needs to be done and great for cooking some burgers, chicken breasts and steaks. Its cooking space of 390 square inches is good enough to cook several foods at the same time and perfect to serve a family of four to six. Its heat output to size ratio is also just right, reaching up a high temperature and heats up fast without a problem especially with the lid closed. Though might have experienced some difficulty in keeping its temperature low. It is well built and has some stainless steel parts. It’s easy to assemble so you can enjoy grilling right away upon bringing this home. Even though it’s pretty inexpensive, it’s not like other cheap 3 burner grills that you can easily find in stores and will not work after several use. Better yet, it’s also easy to clean, to move around and comes with a cover for better storage and keeping it clean, allowing this unit to live longer. Originally priced at around 300 dollars, you can find this at a lower price of an average price of $250. This is a capable grill that also delivers good offers and well-received by users, making this one the best small gas grills in the market perfect for people with small spaces like balconies where grilling is allowed. But if you still have lesser room to own a full height grills, then maybe tabletop gas grills are better match for you. What is great with these, you can grill at home and also bring it outside for picnics or outdoor activities since these are portable. Here are just a few gas grills that really performed well and also got featured as among the best portable and tabletop gas grills. If you are really looking for something smaller then I would suggest that you also read our reviews and articles of it. That sums up our list of the best small gas grills in the market. Remember to check with the local rules where you live to know what kind of gas grill better suits you! These are not cheap, but they are very heavy and will last a long time. A little tip while rlceaping my old ones, I noticed that only one was really worn, the other four were in good shape; so rotating the most worn bar to a different position (before significant wear) would enable the set to last longer.